Waltham Abbey Wool Show is an annual fixture in the yarn calendar – a one-dayer in a small venue in Essex. It’s just six miles from my home in North East London but I’ve never paid it a visit before, because January’s not typically a time when there’s not much cash to splash on the stash. But this year, there were a number of fellow fibre folks exhibing that I wanted to catch up with, so on the spur of the moment I decided to pop along. Cold and deshevilled, I finally arrived, to a warm, woolly, friendly welcome. And I have to say, the bus’s scenic route through snowy Epping Forest was beautiful. The refreshing thing about the show is that its vendors are entirely small, independent businesses, so it is packed with beautiful things. It was nicely busy and bustling, but with a polite crowd and no problems getting close to the popular stalls with a little patience. It’s also very affordable at just £3.50 for an advance ticket or £5 on the door. 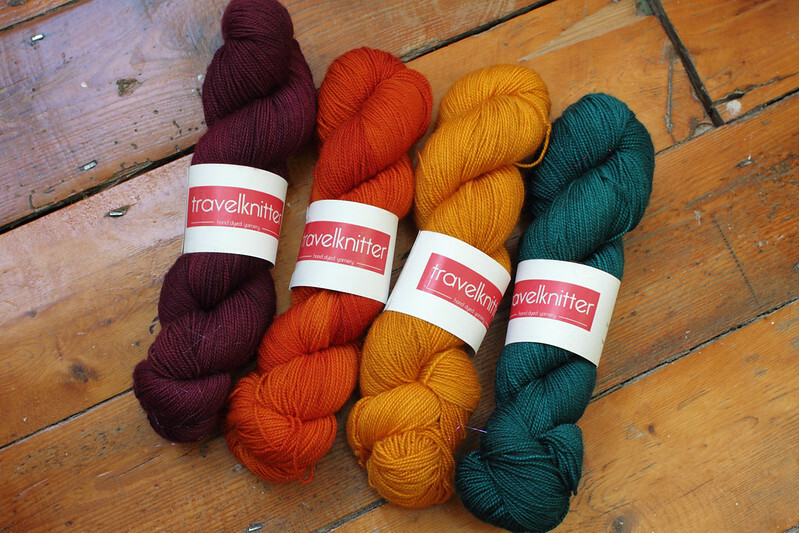 My first stop was Travel Knitter, aka Larissa, a fellow Walthamstow dyer who specialises in deep, saturated colours inspired by her travels. Larissa had teamed up with designer Nathan Taylor aka Sockmatician (who opened this year’s Waltham Abbey Wool Show) to create a kit for his Il Burato double-knit scarf design. I have had my eye on this ever since I saw it in Larissa’s Instagram feed. Double knitting is a skill I have yet to unlock so I’m excited to get started in this project, though I expect it’ll be a bit of a slow burner! It was lovely to finally meet Larissa, though I have of course squished her yarn previously at Wild & Woolly. Also high on my list was a catch up with Louise of Spin City, whose stand was overflowing with fluffy delights, as usual. It is always lovely to see Louise and compare notes about all things spinning and yarn. If you are in the market for a spinning wheel I highly recommend visiting seeking her stand out at a show as she always has a range of wheels for demo. Despite me having quite a spinning queue already, I of course left with a sparkly batt. This one reminded me so much of the purple one from the Northern Lights kit I loved so much. 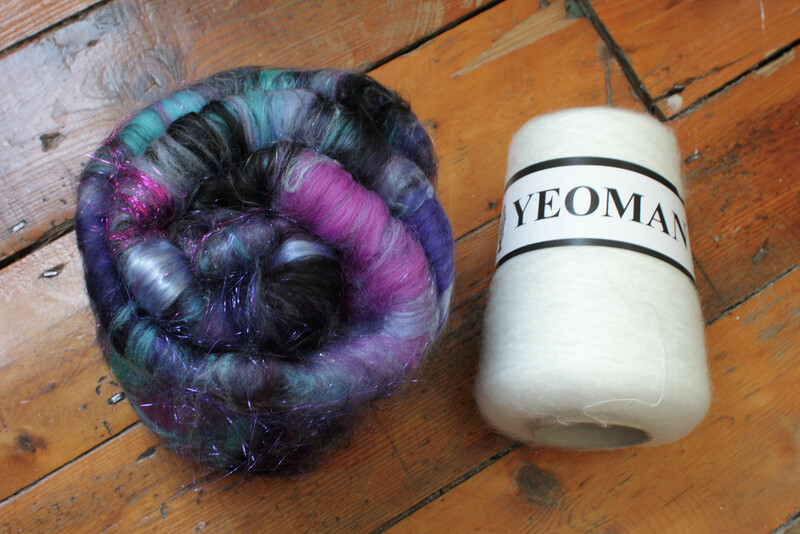 I also picked up a cone of mohair, which is what Louise uses as the ‘core’ for corespinning. I made a small corespun skein over the summer and it was a lot of fun, but I could use more practice. (I also have no idea what to do with corespun yarn just yet, but it looks really cool in my stash). All in all, I highly recommend Waltham Abbey Wool Show for all woolly folks, even if that means venturing on rural* buses in the snow. The affordable ticket price makes it a great day out even if January is a bit too much of a pinch for stash enhancement (though you’d need quite some resolve to come away empty handed). 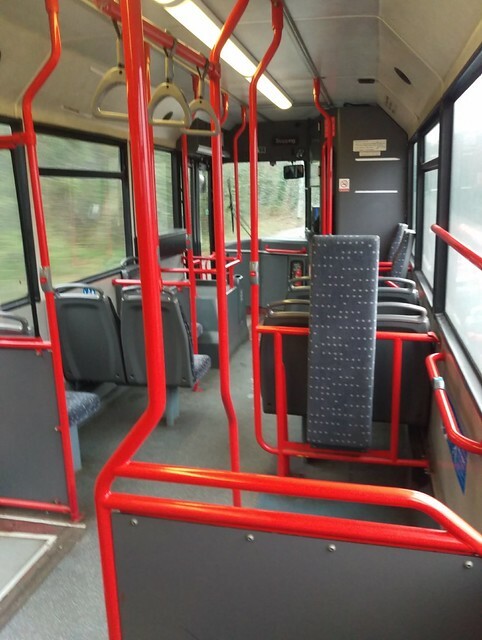 I was the only person on Ye Olde English bus from Loughton to Waltham Abbey. I do see why it is a one-bus-an-hour kind of place. *by rural I mean non TfL. I am of course being terribly rude about public transport outside London only because we are so absolutely spoilt by it here.